in April, I purchased a LaCie “Little Disk” it has a small footprint and a built-in USB cable. I thought that was pretty neat. Then I got it home. Every time I shifted my laptop, it unmounted. we’re sorry that you’ve been inconvenienced by an issue with your LaCie product. Please be assured that we will do our best to quickly provide you with a fully functional unit. We would ask that you carefully read and follow the instructions as detailed in the attached document. Please also make sure you print and stick the attached delivery note on the external package you will use to send your defective unit back to us. Please also note that this document is not an Air Waybill allowing you to send the defective product at our own cost, and can never be used as such. and has stopped my workflow until I can replace it. I CC’d sales on this. 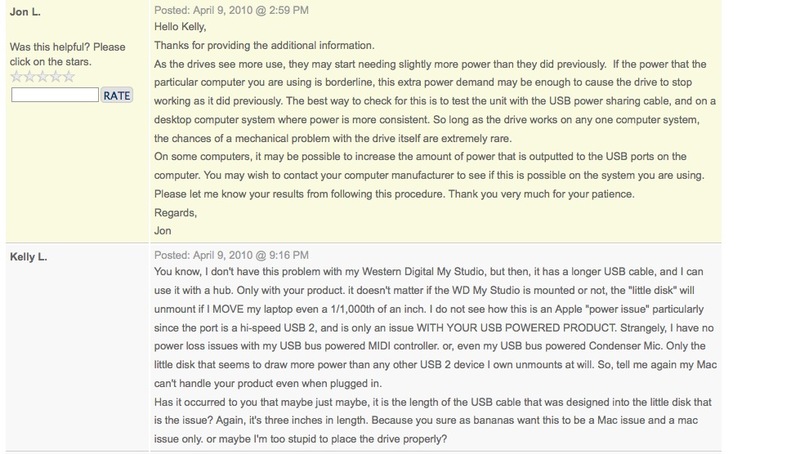 I think, I’m buying a portable WD MyBook Studio.